Tyler Tabman won this tournament one year ago, and is our current reigning US Champion! Today he’s playing Prophecy with High Priestess of Prophecy, Justice of Prophecy, Defender, the Magical Knight, and Cursed Seal of the Forbidden Spell. He’s running Upstart Goblin and Spellbook Library of the Crescent to power through to his most powerful combos. His opponent is Timothy LeDuc, hailing from Marlboro Massachusetts! LeDuc is also running Prophecy, and though he isn’t playing High Priestess or Justice, he is running Spellbook Library of the Crescent. Prophecy’s hugely popular today, so this is sure to be the first of many mirror matches. Would the Champ score the win, or would LeDuc start his day with a major upset? A win here would mean a ton of momentum. 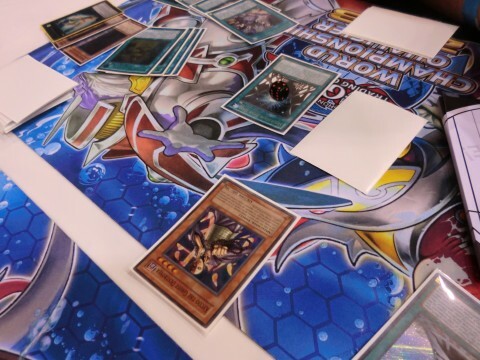 LeDuc started off the tournament with Spellbook Library of the Crescent, choosing Spellbook of Secrets, Spellbook Star Hall, and Spellbook of Fate. Tabman selected one card at random, and LeDuc shuffled the other two back. He tried to activate Spellbook of the Master to copy Star Hall, but didn’t have a Spellcaster on the field. Instead, he followed up with Spellbook Star Hall and The Grand Spellbook Tower. He Set one card to his backrow, then activated Judgment’s effect to Special Summon Spellbook Magician of Prophecy in Defense Positon. He searched Spellbook of Secrets and Spellbook of Fate. Tabman had a hand of Spellbook of Secrets; Spellbook of Wisdom; Spellbook Star Hall; Spellbook of Power; Defender, the Magical Knight; and Kycoo the Ghost Destroyer. He Summoned Kycoo, then activated Spellbook of Secrets to search his Deck for Spellbook of Judgment. LeDuc’s Star Hall went to 2 Spell Counters. He activated it, then activated Spellbook of Power, attacking to destroy Spellbook Magician of Prophecy. Power’s effect triggered, getting Tabman Spellbook of the Master. He activated Spellbook Star Hall in Main Phase 2, then activated Master to copy Secrets; that got him The Grand Spellbook Tower, which he activated. He Set Spellbook of Wisdom, and in his End Phase he used Judgment’s effect to search out Spellbook of the Master, Spellbook of Secrets, Spellbook of Eternity, and Spellbook of Fate, then Special Summoned Justice of Prophecy. He banished her to add High Priestess of Prophecy and Spellbook of Judgment to his hand. LeDuc drew to five cards in hand with one Set in his backrow. He activated Spellbook of Secrets to get Spellbook Magician of Prophecy, Summoned it, and used its effect to get Spellbook of Power. 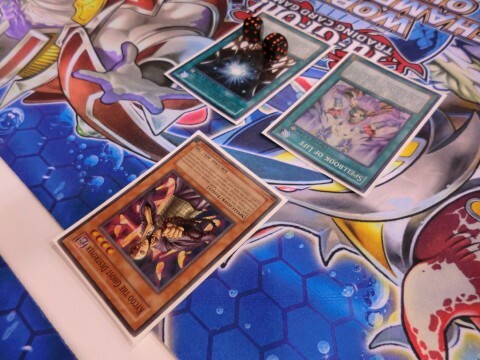 He activated it to Power up Magician, and Tabman’s Star Hall got a fifth Spell Counter: that put Kycoo to 2300 ATK. LeDuc mimicked his Power with Spellbook of the Master, revealing Spellbook of Fate and trying to buff Magician even more, but Tabman used Spellbook of Wisdom to stop the bonus. LeDuc Set a second Spell or Trap and ended, stymied. Tabman drew Upstart Goblin. He activated Tower’s effect to put Spellbook of Fate on the bottom of his deck, drawing Book of Moon. He activated Judgment, then Summoned Defender, revealing Master, Secrets, and Eternity to Special Summon High Priestess of Prophecy! Tabman banished Spellbook of Wisdom from his Graveyard to destroy LeDuc’s Set Spellbook of Fate, then activated Upstart Goblin to draw Spellbook Magician of Prophecy. He activated Spellbook of Eternity to get back his Spellbook of Wisdom, then played Secrets to get Spellbook of Fate from his Deck. Master copied Secrets, getting Tabman another Spellbook of Judgment. That was his fourth Spell this turn, and Spellbook Star Hall was at eleven Spell Counters. Tabman attacked with Defender, destroying Spellbook Magician of Prophecy, then made direct attacks with Kycoo for 2900 Battle Damage, the ended the Duel with a 3600 ATK swing with Priestess! Current reigning US Champion Tyler Tabman wins the first Duel of the day! 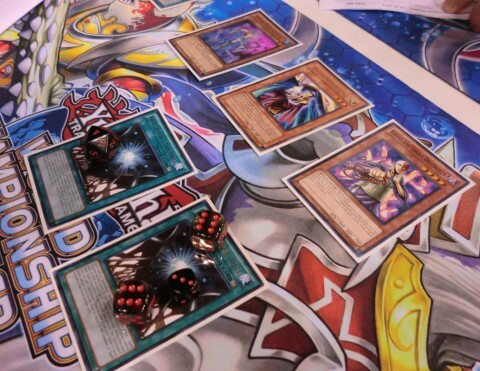 Both competitors made some quick adjustments with their Side Decks, both clearly prepared for the mirror match. LeDuc had Spellbook Library of the Crescent once again, this time revealing Spellbook of Secrets, Spellbook of the Master, and Spellbook Star Hall. Tabman rolled a die to make his pick just as he did in Duel 1, and LeDuc shuffled back the other two cards. He Summoned Kycoo the Ghost Destroyer, activating Spellbook of Judgment and then Spellbook of the Master, revealing Spellbook of Eternity to copy Crescent. This time he revealed Spellbook of Fate, Spellbook of Secrets, and Spellbook Star Hall. He activated The Grand Spellbook Tower, then played Secrets to get Spellbook of Fate. He Set two cards to his back row, then searched Spellbook of Secrets, Spellbook Star Hall, and Spellbook of Wisdom from his Deck with Judgment. He Special Summoned Spellbook Magician of Prophecy in Defense Position. Tabman had Solemn Warning; Upstart Goblin; Retort; Spellbook Magician of Prophecy; Jowgen the Spiritualist; and Spellbook Library of the Crescent. He activated Crescent to reveal Judgment, Master, and Secrets, and LeDuc gave him Secrets. He Summoned Magician to fetch Spellbook of Judgment, activated it, and followed up with Upstart Goblin… but was reminded that he couldn’t activate it due to Crescent‘s effect. Upstart went back to Tabman’s hand. He played on, activating Secrets to get Spellbook of Power. 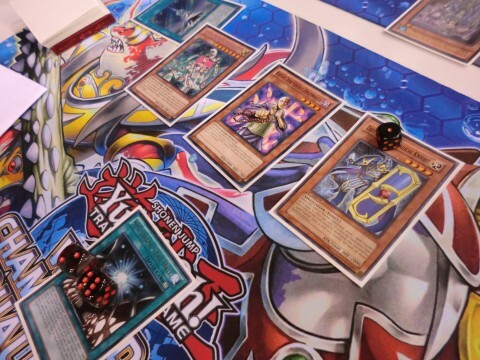 He played it to boost Magician’s ATK, and LeDuc turned Magican face-down with Spellbook of Fate. Tabman Set three cards to his back row, then used Judgment in his End Phase to get Secrets, Master, and Spellbook Star Hall, Special Summoning Justice of Prophecy. He banished her to get High Priestess of Prophecy and Spellbook of Wisdom. LeDuc cycled back Spellbook of Fate next turn with The Grand Spellbook Tower, drawing a card. He Summoned another Magician to get Master, then activated Star Hall, following up with Spellbook of Eternity to get back his Spellbook of Judgment. When he activated it, Tabman flipped Retort to negate it and take back his own copy! That could be the match-winning move right there. 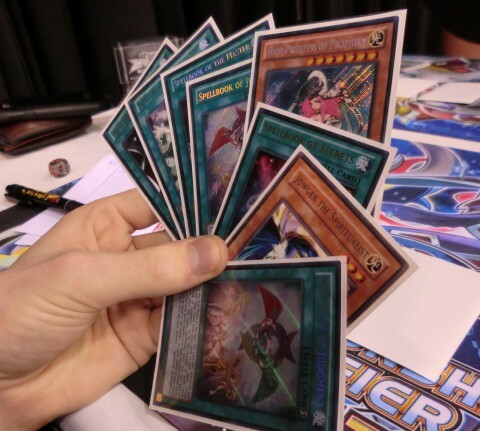 LeDuc activated Secrets to get Spellbook of Fate, then activated Master to copy Secrets, getting Fate from his Deck. He activated it and banished three Spellbooks to banish Tabman’s face-down Magician – three minutes remained in the round. 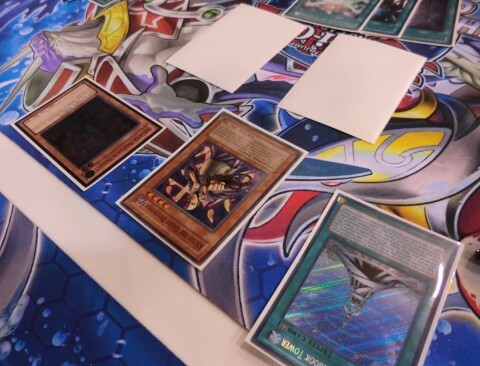 He turned everything to Attack Position, then overlaid his Magicians for Daigusto Phoenix: Tabman negated the Summon with Solemn Warning, dropping to 6000 Life Points. That left Leduc with Kycoo at 2200 ATK. It attacked to lower Tabman to 3800 Life Points. LeDuc Set two more cards to his back row. Tabman ripped another Spellbook of Judgment. He revealed to Special Summon High Priestess of Prophecy, and activated Judgment. He played Spellbook Star Hall next, attacked Kycoo, and destroyed it for 200 Battle Damage. Tabman played Spellbook of Secrets in Main Phase 2 – time was called, so five more turns would be played – and LeDuc responded with Droll & Lock Bird as Tabman got The Grand Spellbook Tower. Tabman played the Tower, destroying LeDuc’s Tower, then used Priestess’ effect to banish Spellbook of Secrets and destroy LeDuc’s face-down Spellbook of Wisdom. That left him with nothing but two Set cards and Star Hall – Tabman Set two cards to his back row, but couldn’t get his searches with Judgment. This was Turn 1 of time. 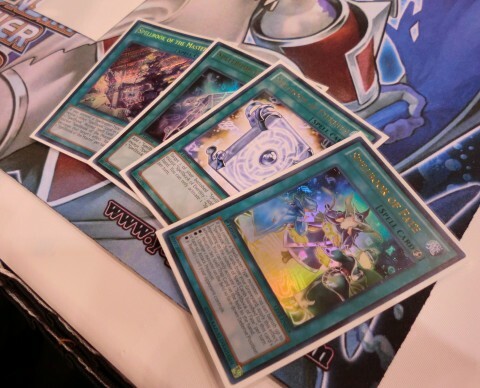 LeDuc drew Spellbook of Power and revealed it for Spellbook of Life, banishing a Magician from his Graveyard to Special Summon back Kycoo. He activated Power, but Tabman Chained Spellbook of Wisdom to make Kycoo unaffected by Spells for the turn. LeDuc had one more Set card: he attacked with Kycoo, banished Priestess with Spellbook of Fate, and then replayed the attack for a direct shot that dropped Tabman to 2000 Life Points. LeDuc had nothing left. Turn 2: Tabman drew Spellbook of Fate, but didn’t have a Spellcaster for his Tower. He had a hand of Fate, Jowgen, Judgment, and Master, with Star Hall active and Upstart Goblin Set. He activated Judgment, Normal Summoned Jowgen, then copied Secrets with Master. He got Spellbook of Eternity, then activated it to get back his Spellbook of Secrets. He flipped Upstart Goblin to draw Spellbook Magician of Prophecy, then activated Secrets to get Spellbook of Fate. He discarded it to banish Kycoo, then attacked for 1100 Battle Damage. He activated Fate to put Jowgen in face-down Defense Position, banishing his other Fate from his Graveyard along with Spellbook Library of the Crescent. In his End Phase he resolved Spellbook of Judgment, getting Spellbook of Power; Spellbook Star Hall; Spellbook of Secrets; Spellbook of the Master; and Spellbook of Wisdom. He Special Summoned Kycoo from his Deck. Turn 3: LeDuc drew and Set one card to his back row. Turn 4: Tabman drew another Spellbook Magician of Prophecy, then activated Star Hall, followed bySpellbook of Secrets to get Spellbook of Judgment. He copied Spellbook of Eternity with Spellbook of the Master, getting back Fate, and activated it to banish three and target LeDuc’s Set backrow card, banishing it: Solemn Warning. Tbman activated Judgment, then Summoned Magician, getting Spellbook Library of the Crescent. He activated Power to boost Kycoo – LeDuc’s Star Hall now had 24 Spell Counters, while Tabman had a collective 19 across his two Halls. Kycoo attacked for 4700 Battle Damage, and attacks from Jowgen and Magician ended the Match! The Champ scores his first win of the weekend! Tyler Tabman takes a 2-0 victory with Prophecy.